Did you know that when making an insurance claim a photo is worth as much as an actual receipt to your insurance company? In the unfortunate case of a flood, fire or burglary, most homeowners are unprepared to provide their insurance companies with a list of their assets.Providing your inventory by memory alone is not the solution and either is trying to acquire proof of purchase or everything of value that you own. Thousands of dollars can be lost, as well as valuable family heirlooms without this valuable information in a safe database that can be easily retrieved when disaster strikes. Perfect Images takes the worry out of creating a home inventory database that can be supplied to you or your homeowner's insurance company at a moment's notice. In our current age, many single family homes are also the location of home-based businesses that have investments such as computers, laptops, printers, etc. Let our professionals guide you in creating a database of the property within your house, including your home business, so that you can rest at ease. When disaster strikes, be proactive and let your home inventory check list be the least of your concerns. Did you know that when making an insurance claim a photo is worth as much as an actual receipt to your insurance company, imagine what a Documented Virtual Tour is worth? 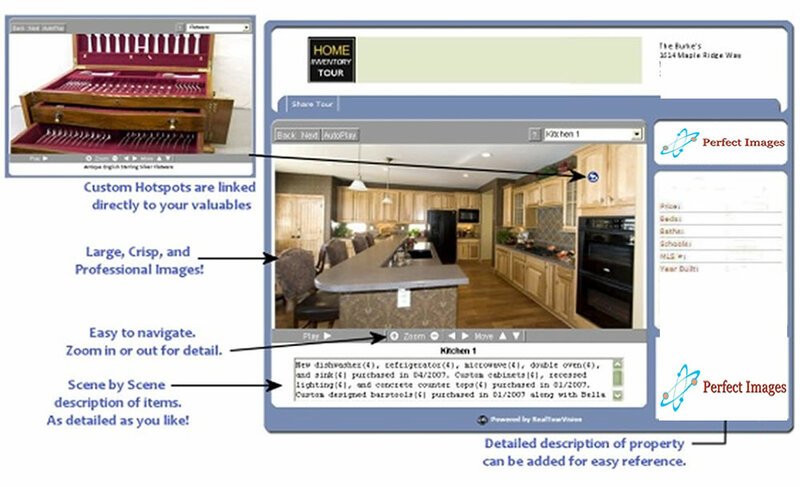 What is a home/ business Inventory Documentation Virtual Tour? A home or business Inventory Documentation Virtual Tour consists of photographing, documenting and securely storing all your personal or business belongings within a residence or business space and also includes off-site premises a well (cars, boats, RVs etc), in our servers and onto a CD for you, making your proof of ownership just a click away. 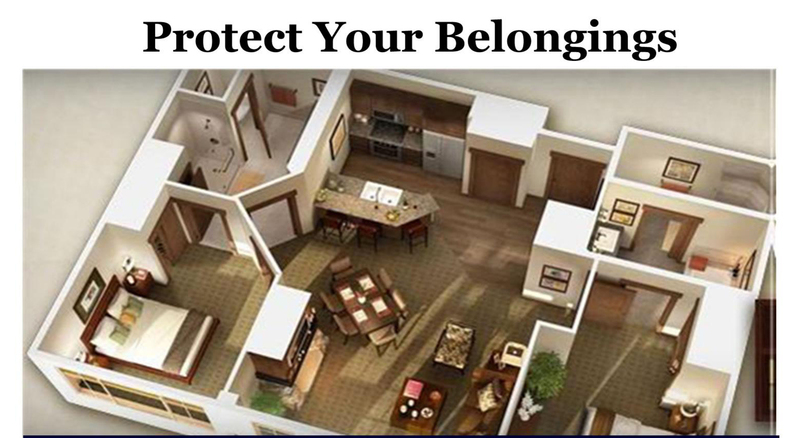 A home inventory not only includes the home structure, but also of all valuables in a house including electronics, furniture, computer equipment, large and small appliances, clothing, jewelry, etc. A business inventory is just as detailed as a home inventory but concentrates more on furniture, business equipment, etc. The most recognized benefit of a home or business inventory is most apparent when an unexpected disaster occurs and the need to file an insurance claim is needed. A home or business inventory takes the second guessing out of the equation when all you are left with is memory to protect your lifelong belongings. What is a Tenant Inventory Documentation Virtual Tour? Residents of apartment rental properties may not own the real estate where they live, but the forces of nature will still affect their property even if they are not legally responsible for the building. Perfect Images creates an accurate record of your inventory with a documentation virtual tour. Rental insurance is important to cover your valuables, but you need a complete account of your contents in order to get the greatest return on your loss. Download your Home Tour Inventory Brochure right here!